Visit www.foodomania.com for the recipe & step by step pictures. yummilicious to the core....wonderful color & texture! 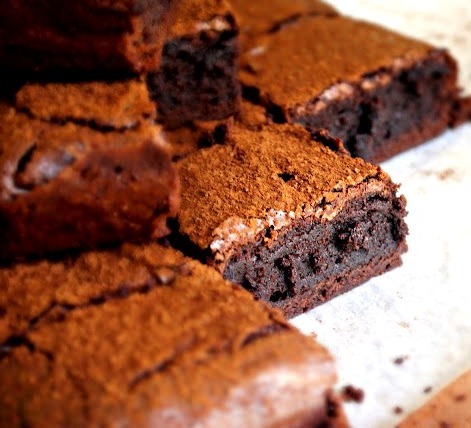 i love brownies...make em all the time(I look like a fudgy brownie myself! )....but i have never evertried an eggless version...really nice. very tempting and delicious..looks so perfect!bookmarked! These look sooo good I could eat them just off the screen. Fabulous!!! wow..double chocolaty ,yummy yummy perfect!! Delicious. I love brownies and this looks not like a first timer's attempt at all. Yumm, yumm, drooling over the pictures..
Any chocolate is okay if you know my kids. This one will be special favourite. This is tempting me sooo much... with the heavey rains the electricity here cannot be depended on...i can't wait to try this. hey..lovely space you have, liked your version of brownie..the slices look too tempting & perfect! I am always on a look out for a perfect brownie recipe for my kids..this one looks simple and delicious both :) ..moving onto your caramel recipe! yummy! i haven't made brownies in such a long time, though a year ago all i did was brownies haha! but eating them hot with ice cream.... isn't that crack bad for the teeth?? Yum! I already have everything at home to make this!